The following article will appear in an edited form in the Fall issue of Jesuit Journeys Magazine. Upon publication, it should be accessible via this link: http://www.jesuitpartners.org/site/PageNavigator/News%20and%20Events/WPJ_Jesuit_Journeys.html. My sincere thanks to Rory Gillespie, Assistant for Communications in the Wisconsin Province of the Society of Jesus, for editing and publishing this piece. Not studying education in college is one of the many shortcomings I am discovering in my work with the Jesuit Volunteer Corps here in Peru. 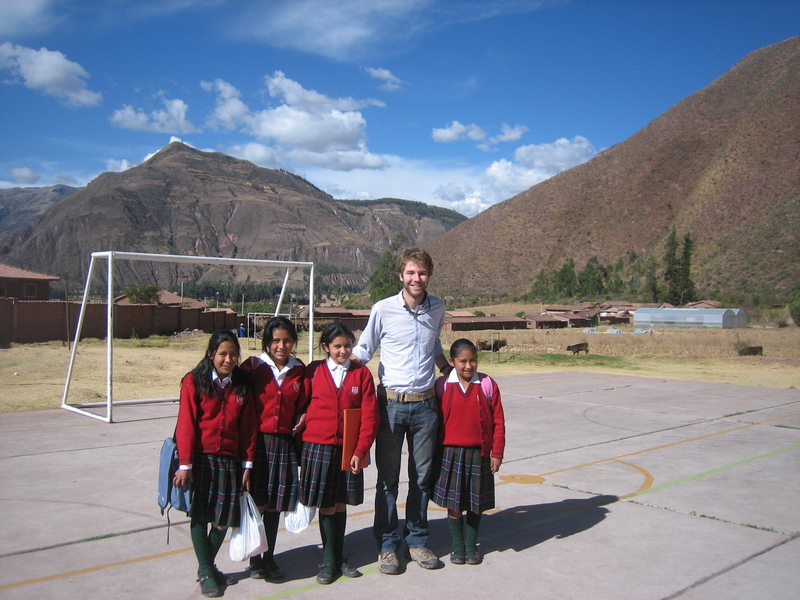 With the help of the people and students at the Fe y Alegría high school in Andahuaylillas (pronounced On-duh-why-lee-us), a small town located in the Peruvian Andes, I am conquering most of them. As I teach English, my personal and cultural horizons are broadened and graced here in South America. It is still frightening at times to be responsible for the education of more than 120 children. It is Nuria and other students like her who educate me. With First Year students (L to R) Neshaly, Mayra, Nuria and Katerin Jimena. Photo by: Mateo Pimentel. After handing in my grades following my first trimester, I decided to reward myself by taking a break from hanging out with 12 year-olds and visit a friend in Cusco, a large, metropolitan city about 30 miles from Andahuaylillas. My respite from pre-teens was short-lived. At the highway where I would catch my bus, I noticed one of my students, Nuria, standing at the bus stop in anticipation of her own ride. Though I had really been looking forward to an hour of silently staring out the window at mountains, I decided to do the right thing and say hello. Nuria is a shy girl with a round, cherubic face and a subtle, delicate smile that might suggest a mischievous streak were she not so kind and well-mannered. While she does not fit the stereotype of the class clown, she also cannot be pigeonholed as a teacher’s pet. A few weeks prior, Nuria’s father had visited our school to speak with some of his daughter’s teachers. He specifically asked me if there were any extra opportunities for her to practice English. Had this interchange not occurred, I might not have known her name. It is common for quieter kids like her to get lost in the sea of students who do good work but do not call much attention to themselves. First Year students Julio Cesar and Pamela during English class. Photo by: Mateo Pimentel. After exchanging a few pleasantries, Nuria and I boarded the bus and grabbed two of the remaining vacant seats. What at first had seemed like a disruption in my plans quickly turned into one of the most pleasant conversations I have had since coming to Peru. Nuria told me all about herself, how her family lives in Cusco and how during the school week, she stays with her aunts who live closer to Andahuaylillas. She told me about her mother having a new baby and her father’s job in the security industry. She also proudly mentioned her brief stint studying English at an institute in Cusco and spoke extensively about her interest in Incan history. The chat took a slightly uncomfortable turn when Nuria began to criticize one of her classmates. Though unfailingly polite, Nuria was clearly annoyed by the extent to which this particular student acts out in school and distracts his teachers from their lessons and his peers from their learning. While I could not disagree with her–the person she spoke of will probably give me gray hair by year’s end–I had no desire to bad-mouth one student in front of another. Nuria’s irritation aside, we had a wonderful talk that I was sad to see come to an end. After wishing her a nice weekend, I went on my way and met up with my friend. First Year English class. Photo by: Mateo Pimentel. Over the next few days, I thought more about my spontaneous run-in with Nuria. She had shared so many fascinating anecdotes, spoken with such passion for her interests and shown so many delightful qualities I had been completely oblivious to during the first three months of the school year. It was overwhelming to realize how little I had known about her and, in turn, how ignorant I remained about the lives of most of my other students. I also considered the comments Nuria had made about her classmate. At the time, it seemed like Nuria was simply venting minor piques or perhaps attempting to take my side against a student who clearly bothered me as well. This has been a good lesson to bear in mind as the second trimester gets underway. Lately, I have tried to do more to reach out to those students who tend to mix into the crowd. I have assigned short autobiographies in one of my classes, partly out of a desire to better understand the realities each and every one of my students lives with each day. I have also sought to remember which of the five students named Josè in my class is which. It is easy for me to lose sight of these aspects of my job. I am more accustomed to a Western, task-oriented mindset, where there is work to be done, a “to-do” list to be completed, English to be taught and, when appropriate, discipline to be meted out. What conversations like the one I had with Nuria remind me, however, is that teaching is, in some ways, the backdrop to a more significant purpose for my time in Andahuaylillas. I am learning about and sharing friendship and community with my students and all the Peruvians I meet. Fe y Alegrìa high school students gathered for Cìvia, the school assembly that takes place each Monday morning. The Peru Province of the Society of Jesus has a Twinning Agreement with the Midwest Jesuits through the Chicago-Detroit Province. Fe y Alegrìa is a popular educational movement with more than 40 years in Peru and consists of more than 75 education centers that offer a free education to more than 80,000 boys and girls in 19 states in the country. 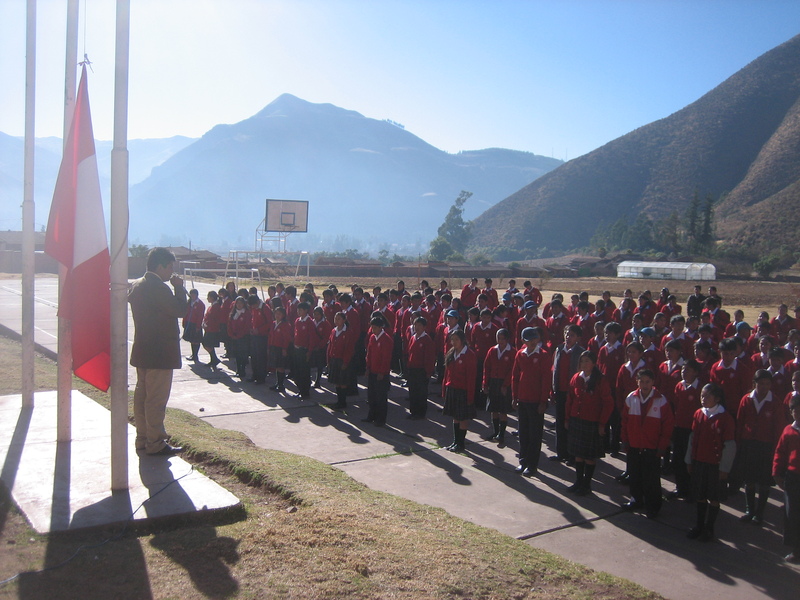 Thanks to the generous support of various persons and institutions, the Peruvian state and more than 45 religious congregations, thousands of Peruvians have been and continue to be formed as democratic citizens with Christian values, academic expertise and trade skills that meet the emerging economic and material realities of Peru. A Twinning Agreement brings the Wisconsin Province into a sharing agreement with the Peru Province, marking a new chapter in international sharing. Chicago-Detroit Province has twinned with Peru since 1958, and this opens a new frontier for cooperation with a vibrant Latin American province. Due to global economic gaps, it is natural that province twinning may include some elements of financial sharing, but more importantly twinning agreements also enact other aspects of giving and receiving by participating Jesuit provinces and ministries. Through greater international contact, we have also discovered how much Midwest Jesuits and collaborators have been evangelized by the heroic work and witness of the international Jesuits we have learned from and befriended. 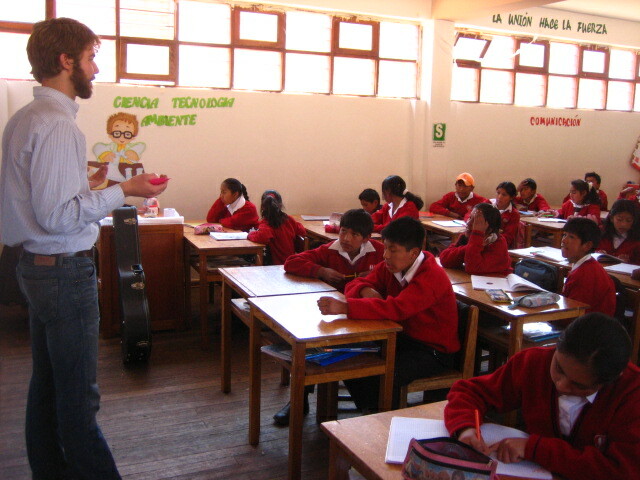 Jesuits in Peru administer schools at all grade levels (primary through tertiary). They have also established parishes, spiritual ministries, radio stations and social centers which serve the urban poor in Lima and other cities (housing, health, nutrition) as well as serving indigenous people in the rural areas (particularly the Andes mountains and the Amazonian forests). Jesuits are engaged in reconciliation work following the long and difficult civil war between the government and the Maoist Shining Path rebels. Peruvian Jesuit Archbishop Pedro Barreto (Huancayo) is courageously leading an effort for responsible environmental practices at a metallic smelter in La Aroyo, often described as one of the most polluted places on earth. 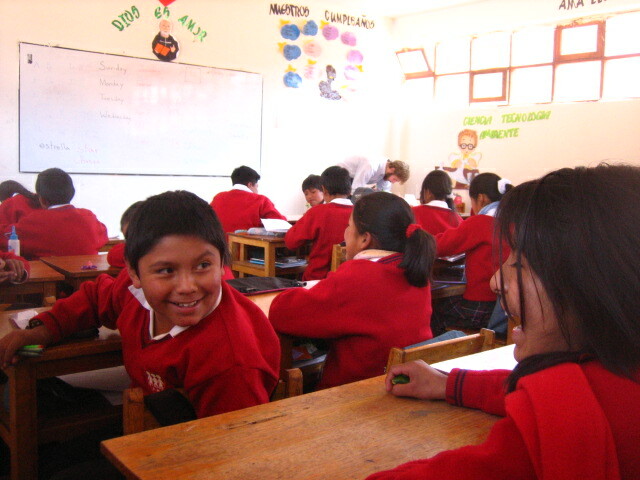 Learn more about the Peru Province on its English-capable website http://jesuits.pe/index.php. This entry was posted in Uncategorized and tagged Amazon, Andahuaylillas, Andes, Archbishop Pedro Barreto, Chicago, Cusco, Detroit, Education, English, Fe Y Alegria, Huancayo, Inca, Jesuit Journeys, JVC, La Aroyo, Peru, Shining Path, Twinning Agreement, Wisconsin. Bookmark the permalink. Excellent article, Brian. I appreciate your heartfelt sentiments and thoughtful reflection. I love that you keep this blog and that you let others share in your experiences and ideas. I also love that you’re writing has many avenues, it seems, and that you’re dedicated to crafting your prose as you craft lyrics. I haven’t much to say other than this for the moment, except that I will be sending a letter to you in the next few weeks. Want/need anything from Milwaukee? I can do that, too. Also: No need to have studied education in college. Trust me. Education (from the Latin, “educare”) means “to lead out of.” But as you know, education is a process of leading and being led–and it’s not always clear who leads whom, and to where. Seems to me like you’re experiencing education as this process right now, and are doing so fully. With others. Good stuff.